A cold war spy story set in England, Ireland and Malta, The Mackintosh Man is one of the more curious examples of the genre. With legendary American director John Huston at the helm, Paul Newman playing a pretend Australian criminal working for British intelligence, French actress Dominique Sanda as the strangely cold daughter of a senior British spook, and the action hopping to the islands of Ireland and Malta, The Mackintosh Man has a high weirdness quotient, but all the unexplained accents do contribute to the sense that the global espionage game is afoot. In London, as member of parliament Sir George Wheeler (James Mason) rails against weak-kneed government officials who are not doing enough to protect national security, Joseph Rearden (Paul Newman) flawlessly carries out a diamond theft at the behest of spy master Mackintosh (Harry Andrews) and his daughter Mrs. Smith (Sanda). Rearden is nevertheless apprehended and thrown into a high security jail. 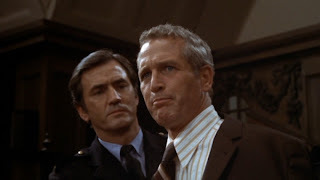 Due to Rearden's perceived diamond wealth, he is a prime candidate to be busted out of jail by a shady criminal organization in exchange for a fat fee, and his fellow escapee is Slade (Ian Bannen), a communist spy. The break-out lands Rearden and Slade in an isolated Irish mansion as a staging point for points beyond, and that is where Rearden's true identity as an agent is betrayed. Mackintosh's real mission is to expose the shady politicos providing support for spies like Slade, but they turn out to be more ruthless than he expected, leaving Rearden and Mrs. Smith having to fend for themselves and battle the traitors. Co-written by Walter Hill, The Mackintosh Man succeeds in creating a grim le Carre cold war ambience, aided by a rather depressed London of the early 1970s. Huston and Newman ensure that the film is always engaging, and Sanda is interesting to watch if only to monitor how far her temperature dips below zero. Andrews, Bannen and Mason bring beefy British heft to the secondary roles. The Irish landscape and the Maltese setting add an element of freshness, but ultimately The Mackintosh Man doesn't succeed in ever really taking off, and the final chapter regresses from an intelligent spy story to a routine action flick. It's a film that with plenty of thoughtful density but insufficient airflow to sparkle.